Picea glauca J W Daisy's White is an attractive pyramid shaped, dwarf White Spruce tree growing to just 1 x 1 metres in 20 years. 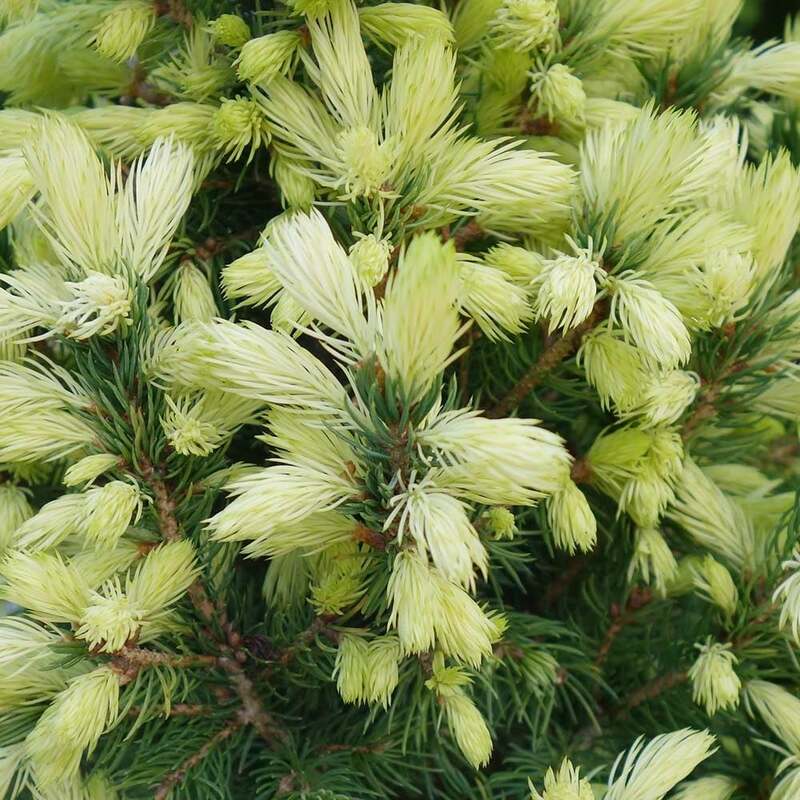 With needle-like foliage that is mid-green throughout the year, the spring growth is a contrasting creamy white colour and really lights up this small evergreen tree. Most well-drained soils will suit in either full or part sun will suit this neat little dwarf Spruce tree and some exposure can be endured. Daisy's White Spruce tree is ideal for a rockery, container or small spaces where year-round structure and interest are required. Our Picea J W Daisy's White conifers can be planted at any time of year. Remove weeds and grass within a metre of your desired planting hole, then dig a square hole as deep as your root mass and approximately 2x as wide. To help White Spruce trees establish more effectively, we advise applying root grow (sprinkle in the hole for pot grown trees). If you’re planting White Spruce trees in spring, summer or dry weather, water well and regularly for the first few months. Make sure to keep an eye on young trees and increase watering if there are extended periods of hot or dry weather. If you’re planting in autumn, you may only need to water your tree a little. We stock a range of irrigation kits, suitable for a variety of planting schemes. Once planted, keep the area free of competing weeds and grass for the first couple of growing seasons. Installing a mulch mat will aid in this. Do not just mow the grass around the area as this will encourage it to grow more vigorously. Ornamental conifers, such as J W Daisy's White, do not require much pruning. Simply remove any dead, diseased or awkwardly placed branches as and when you see them.